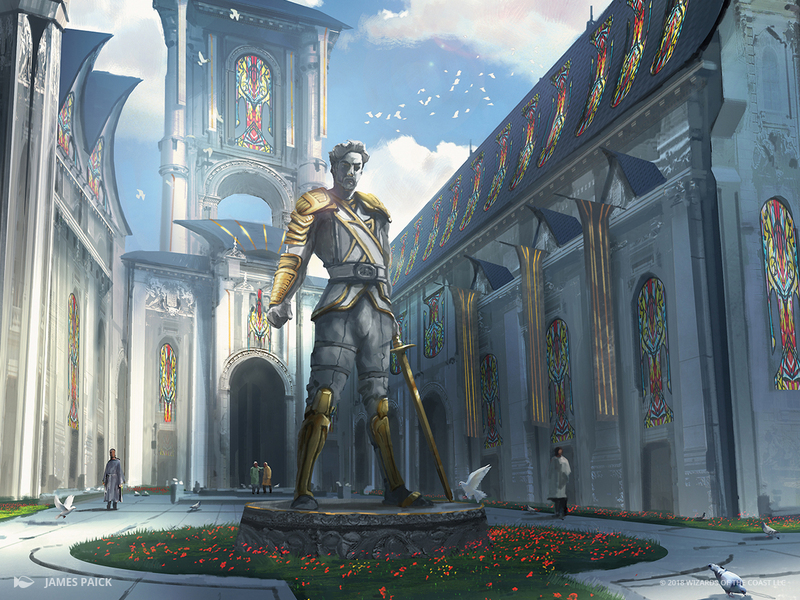 Dominaria is a world defined by its history. Even the Brothers' War, which feels like the ancient past, began long after the fall of the Thran civilization. The apocalypse has come to Dominaria—three or four times, actually—yet here we still are. On a plane so steeped in its past, it makes sense that the local cultures value their rich and complex history. 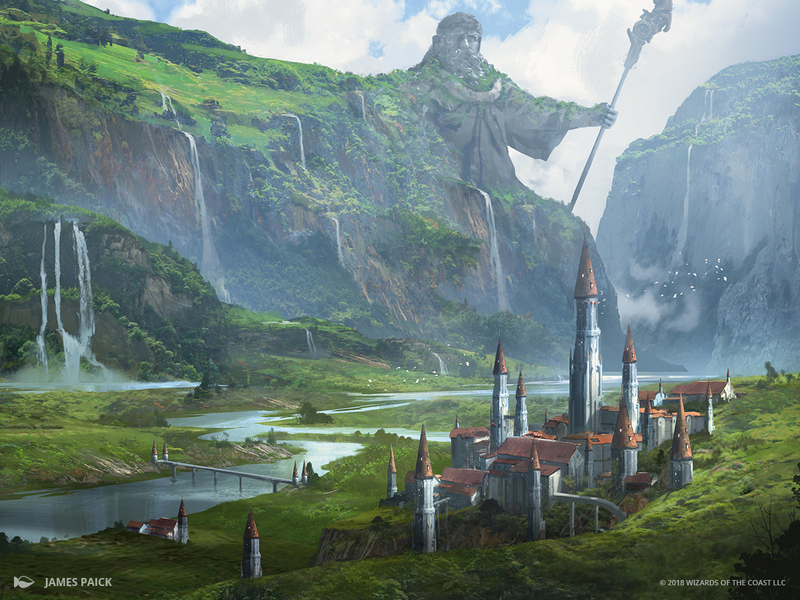 Dominaria explores this in part through its Sagas, which tell the story of the plane one chapter at a time. Incredible, right? I especially love how each land's ability can be read as inspirational. Why does Memorial to Glory make Soldier tokens? Well, perhaps those new Soldiers were inspired to join because of Gerrard's heroic visage. Similarly, perhaps the statue of Eladamri on Memorial of Unity inspires those who see it to take up his cause. These great heroes and villains from Magic's past may be gone, but this cycle of lands shows us that their spirit and influence still remain. Let's take a card-by-card look, shall we? It comes as no surprise that Memorial to Glory depicts the great Gerrard Capashen. One of Dominaria's greatest heroes, Gerrard led the Weatherlight crew against the Phyrexian invasion and helped defeat Yawgmoth before he was able to completely destroy the plane. 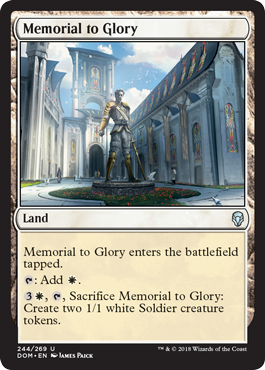 The stained-glass windows behind the Memorial to Glory tip us off to the fact that the card is set in Gerrard's homeland of Benalia, where he is still beloved. Artist James Paick does an excellent job of showing us how much the Benalish admire Gerrard. The statue's gleaming gold armor paints Gerard in a regal, idealized light, and the memorial's placement at the center of a well-kept chapel courtyard speaks to its importance. Dappled sunlight pulls our focus toward Gerrard's proud posture, and the slight low angle gives us a sense of the importance that Gerrard holds, even today. I'd recognize those round, red-roofed spires anywhere. If this isn't the Academy at Tolaria West, then surely Memorial to Genius is giving us a glimpse at one of the academy's other expansive campuses. 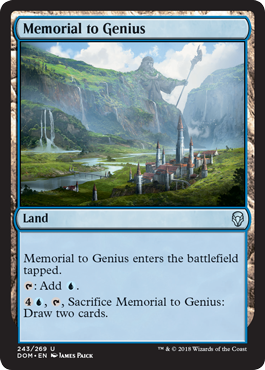 The original Tolarian Academy was destroyed many years ago, of course, but it makes sense that the Wizards in charge of the school's legacy would want to honor their founder in some awe-inspiring away. Carving his likeness out of a mountainside, for example. While the Benalish seem to see Gerrard as an aspirational figure, Urza is depicted here more like a titan or a distant god. His likeness towers over the campus, as powerful and imposing as his intellect was during life. Urza is a complex man; the Phyrexian invasion could not have been stopped without him, but he was also responsible for one of the greatest calamities in Dominarian history when he unleashed the Golgothian Sylex. It makes sense that he looms over the academy as a massive figure, even in death. Here we see Urza and Gerrard again, but the context is quite different. 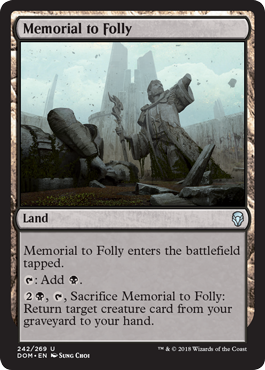 We're at the Martyrs' Tomb, which the Planeswalker Freyalise created back during Apocalypse as a memorial to those who died during the Phyrexian invasion. 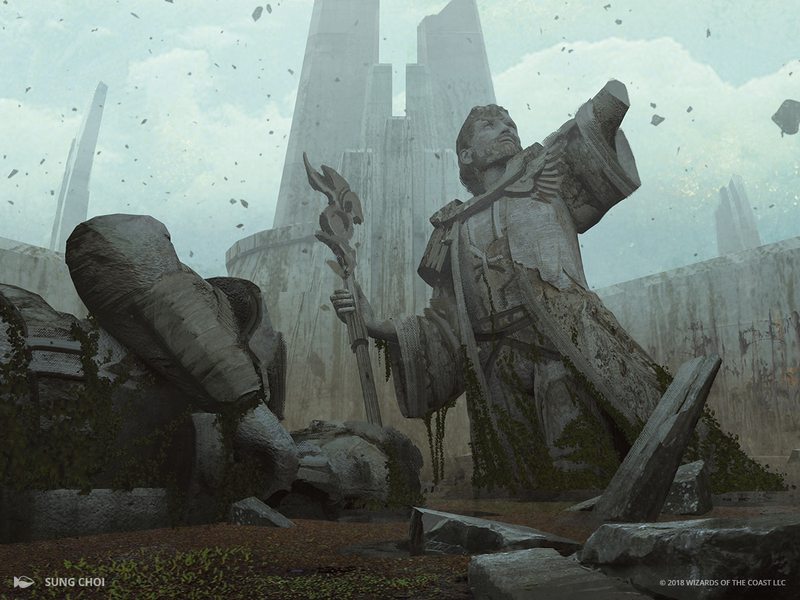 These twin statues of Urza and Gerrard were erected at the tomb's highest point to represent the two fallen heroes most responsible for ending the war. Memorial to Folly depicts the Martyrs' Tomb as a broken place. The spires have been shattered and the statues of Urza and Gerrard have been defaced. Unlike in Benalia and Tolaria, the Cabal in Urborg seems to have no interest in honoring the heroes of the past. The sky is full of ash, and this once-storied monument is covered in mud and moss. Hmm—I wonder if the Cabal's dismissal of history will come back to bite them at some point in the future? Whoa, it's Karona! In case you weren't paying close attention to the storyline back during Scourge, Karona was the physical manifestation of all Dominarian mana. Mortal beings could not help but worship her even though she had no true divinity, and the result was a bloody, chaotic war that left the continent of Otaria in ruins. 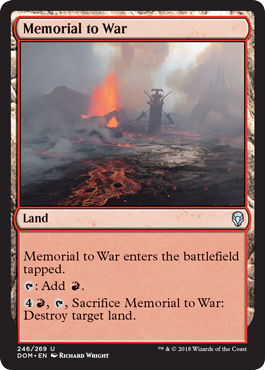 This is not a monument to a great hero from Dominaria's past, but to a discordant false god who presided over a war-torn era. Artist Richard Wright does a good job letting the volatility of the landscape remind us of the chaos caused by Karona's war. 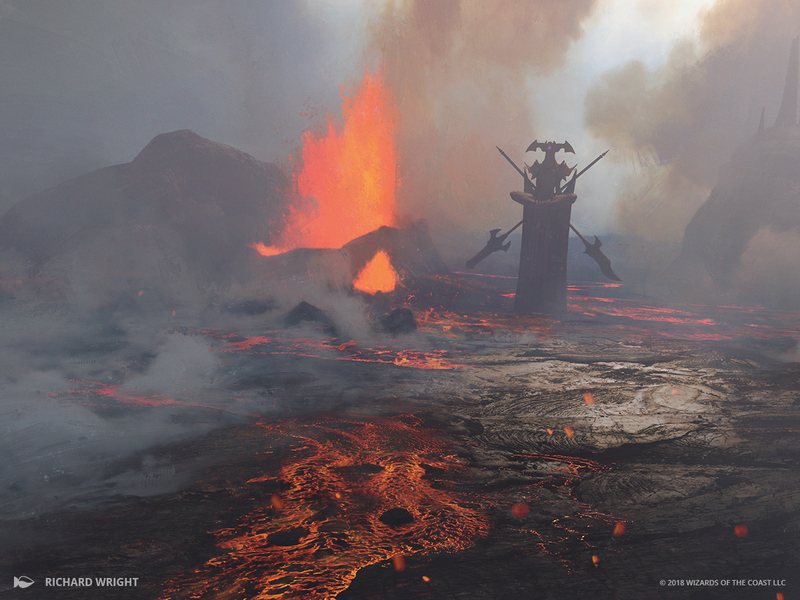 The land underneath the statue is barren, volcanic, and in constant flux. You can't even see Karona's face; instead, her unmistakable figure is depicted in silhouette, as if she is still presiding over the destruction the continues to erupt at her feet. 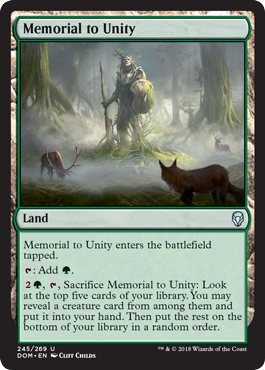 The result is an ominous memorial to a dark chapter of Dominarian history. 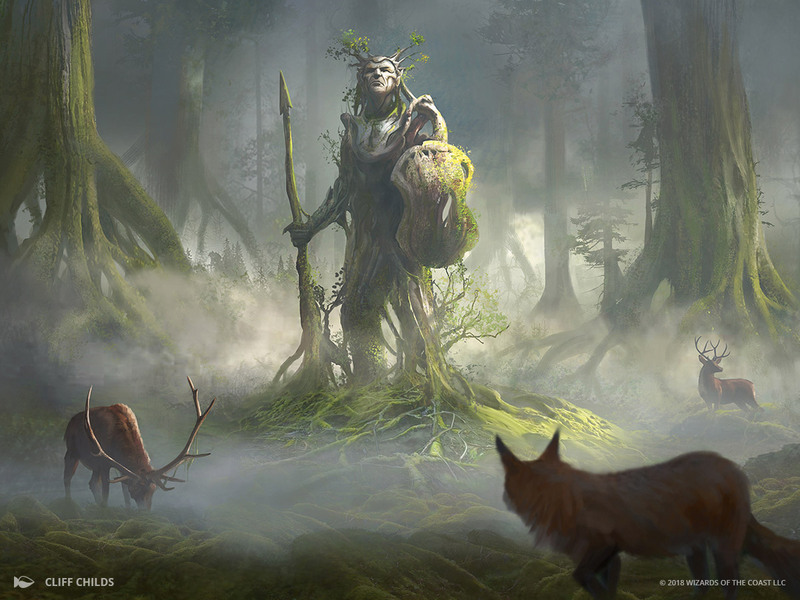 Eladamri isn't native to Dominaria; he was born in the Skyshroud Forest on the plane of Rath. He was one of the first to warn of the Phyrexian attack, though, and the valiant Elf helped save Llanowar from Yawgmoth during the early days of the war. A strong leader, Eladamri brought many Dominarian factions together and united them in opposition to the Phyrexians. Artist Cliff Childs uses his canvas to depict a memorial that is incredibly lush and verdant. Eladamri's likeness has been sculpted out of wood, not stone, and it appears as though several living trees have been incorporated into the monument. Eladamri doesn't stand in opposition to the environment here; he's a part of it. What better way to showcase unity? I also love the prominence of the forest animals here. Not only do they help establish scale, but their tension-free body language helps establish the feeling that this clearing is a safe, almost sacred space. Well, I sure feel inspired to build a deck or two featuring some of these awesome cards. Good thing Dominaria will be arriving soon—I can't wait!